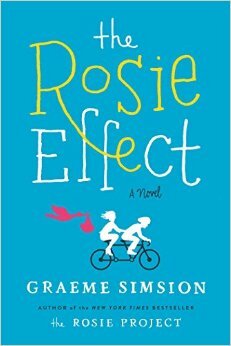 This is the sequel to The Rosie Project (which I guess I neglected to review!) and, as with most sequels, it loses a tad to the original. I highly recommend reading them in order – almost mandatory with this one. Don Tillman, our 1st person protagonist, is a bit odd – he’s 40-something and extremely intelligent, a professor of genetics with almost no social graces. He probably fits in the high-functioning autism spectrum disorder – perhaps some form of Asperger’s perhaps. It’s never explicitly stated (that I recall) but it’s obvious – this is the central issue of both books. In The Rosie Project Don managed, finally, to get beyond a first date and beyond the lists of requirements in a mate, and he married Rosie, the bartender’s daughter. In The Rosie Effect the couple is dealing with Rosie’s pregnancy and if you’ve read the first book you can understand that Don might have some problems dealing with the “suggested” diets and exercise routines and alternate schedules for pregnant women. That man is on a rigorous schedule for everything. What he can’t deal with so well, is Rosie’s heightened emotional state, the changes in the relationships, and so on. These are very light books – for entertainment only – although I suppose a reader might gain some insight into the mind of a person afflicted with Asperger’s. The Rosie Effect has a few too many contrived incidents and situations which are close to slapstick but still, if you enjoyed The Rosie Project you’ll likely find yourself laughing and rolling your eyes with it’s successor. Don O’Grady reads both books quite nicely.